Anonymizer is an old VPN service. Does it still have some steam left? Anonymizer VPN is probably one of the few VPN services that has been in existence since the beginning of the internet. That is the mass adoption of the internet. Yes. This is the same company that was founded in the United States of America way back in 1998. In the online world that is almost like a century ago. 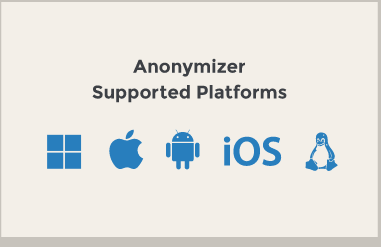 So why haven’t you heard more about Anonymizer VPN? We’ll get to the reasons for that in a bit. First, you should know that Anonymizer VPN is a real fighter. How do we know that when we haven’t even started the official review? We know that because to stay up in the online business for over 19 years you need to have a lot of fighting spirit. The online industry is tough. Businesses that can’t take the heat are always advised to stay out of the kitchen. Anonymizer VPN, on the other hand, has gone through some drastic changes and has come out alive every time. But is it a competitive VPN service? It is certainly competitive if you think about the fact that it has managed to stay with the industry for such a long time. The VPN industry is one of its kind. Even in the online world, it is considered to be one of the most competitive industries. All of your business is online. Therefore you only have a website through which you can make an impression on new potential customers. Blow that chance and no amount of TV ads are coming to save you and your business. On the face of it, Anonymizer VPN is pretty Okay. It’s not for everybody. Let’s just say that. You’re going to have to read the full review to find that out. Since there is no one VPN service for all mankind, you’re going to have to decide if a particular VPN caters to your needs. At a reasonable cost that is. 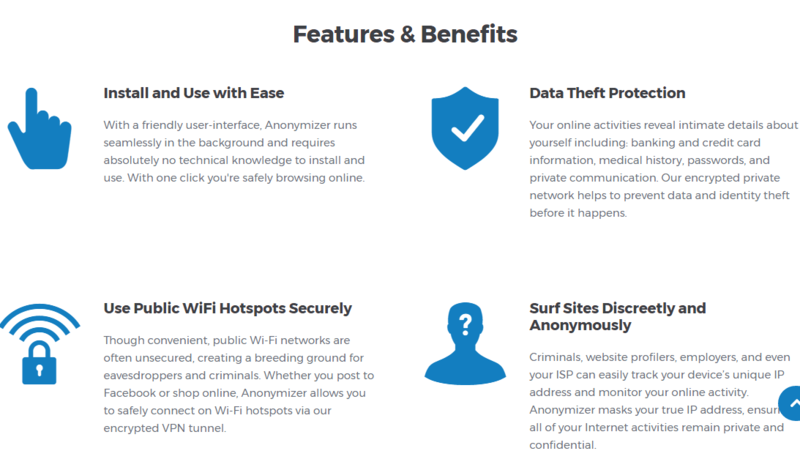 From what we have researched and reviewed, Anonymizer VPN is slightly expensive for what it is offering. The one odd thing about Anonymizer VPN is that it markets its products as computer security products. Which is really unconventional since most other VPN service providers specifically market themselves as privacy and anonymity protectors. Maybe the team behind Anonymizer VPN marketing department thought it was best to go this way. Most VPN services in the market today offer several subscription plans. Some offer monthly packages along with weekly and daily ones. Almost all VPN services offer yearly packages. Anonymizer VPN is a bit different. In order to keep things simple for customers, Anonymizer VPN does away with monthly and weekly plans. Instead, the company offers yearly plans. But that doesn’t mean Anonymizer VPN plans aren’t as restrictive as some of the others offered by other VPN services. 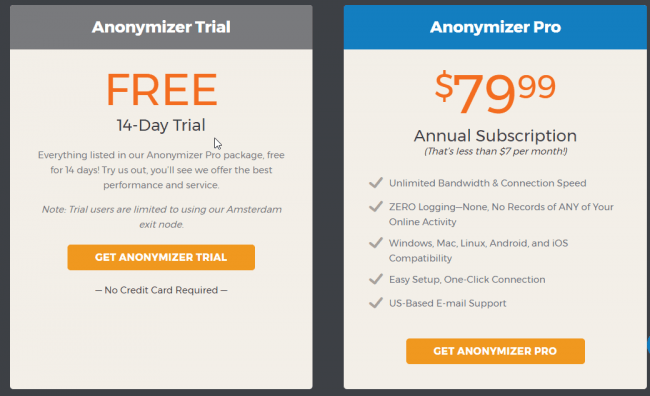 In short, if you want to subscribe for Anonymizer VPN you’re going to have to do it for a minimum of one year. And it will cost new users about $79.99 per year. And you should come to a figure of $7 every month. Of course, this means that Anonymizer VPN is not the most expensive VPN service around. But it isn’t exactly cheap either. Paying $7 for any premium message should be seen as a blessing rather than a curse. But what really matters is the quality of the package. No point in subscribing to a really cheap VPN service only to find out it doesn’t work. But, we’ll come to those aspects of Anonymizer VPN a little later in the review. What Do You Get For Anonymizer VPN $79.99 Package? If you subscribe to Anonymizer VPN yearly package you’ll have the option of connecting up to five simultaneous devices. Of course, that number is more than you are ever likely to use. But as far as the VPN industry is concerned, that number is pretty standard. Maybe you’re starting to recognize a pattern with the services Anonymizer VPN is putting up on offer for new users. Anonymizer VPN has custom software packages for operating systems such as Windows, Linux, Mac OS and Android. We’ll talk more about this later in the review. For now, you need to know that if you want to run Anonymizer VPN on Android, you’ll need an additional piece of software. You can get that additional piece of software from the Google Play Store by clicking here. If you have ever subscribed to a yearly service, you know there are going to be some downsides. Anonymizer VPN service is no different. The first downside is kind of obvious. With a yearly subscription in your pocket, you’re basically stuck with the same service for a period of twelve months. Now that’s a lot of time. You may not want to jump right ahead and marry Anonymizer this way. To help you decide more carefully, Anonymizer VPN has a trial period. This trial period can last up to 14 days and you can avail the service for free. If you’re not comfortable with the 14-day free trial period then Anonymizer VPN has another way to lure you in. But not just any money back guarantee. Anonymizer VPN offers a full-fledged 45-day money back guarantee for all new users. You can leave Anonymizer VPN within the time period if you feel this VPN service is not for you. Needless to say, this 45-day money-back guarantee is certainly one of the longest in the business. In fact, if you twisted our arm and told us to name another service that offers this many days as money-back guarantee period, we wouldn’t be able to come up with an answer. What’s the obvious advantage here? Customers will feel a lot more comfortable moving forward with their purchase and will actually like Anonymizer VPN just because of the fact that the company offers such as a long testing period. Still, that mammoth money-back guarantee doesn’t make up for the fact that Anonymizer VPN doesn’t offer a monthly package. Does It Have P2P Download Option? You’ll be glad to know that Anonymizer VPN allows users to engage in peer to peer downloading activities. The company specifically states that it does not monitor its user’s activities on the P2P network. It also doesn’t block downloads on the network and does not restrict network traffic in any way. And perhaps we should have seen it coming given Anonymizer VPN doesn’t have anything spectacular up its sleeve yet. Officially, Anonymizer VPN does not support users downloading copyrighted content. No one does. So what’s the big deal? The big deal is the permission of P2P connection. Why else a VPN company allow P2P activities if it didn’t want people to download copyrighted content from the internet. You can read through the end user license agreement which is available on the official Anonymizer VPN website. As we have mentioned earlier as well, Anonymizer VPN does not monitor traffic. So even if you engage in P2P activities, it has no way of knowing what you’re doing. What About Other Features Such As DNS Leak Protection? Fortunately, for every user who is genuinely concerned about his/her privacy, Anonymizer VPN has DNS leak protection. The feature is actually built right into Anonymizer VPN Windows client. Needless to say, the DNS leak protection feature is one of the premium features in the VPN industry. In other words, a VPN offering such as feature is a clear sign that it wants to rank itself among the best. If you’re serious about signing up for a pro VPN service, then you don’t need to look further than the DNS leak protection feature. Do take note that the DNS leak protection feature is sometimes also written as Leak Blocker. So don’t get confused because of the different terms. Other reviewers in the industry have specifically mentioned that the DNS leak protection feature for Anonymizer VPN works well. That is, you won’t be able to detect any DNS leaks during any given tests. This is precisely the only aspect of Anonymizer VPN that can’t even be considered as okay. Let’s just say that if you sign up for Anonymizer VPN, you’ll be extremely restricted in terms of choice of server location. In numbers, we mean, that you’ll have a grand total of two server locations. If you’re on the 14-day free trial period then you don’t even get that. On the free trial period, you only get servers that are located in Amsterdam. So if you wanted to sign up for the free trial because you wanted to test out server location, then bad news is waiting for you. Moreover, Anonymizer VPN is virtually of no use to you if you want to unblock websites with it. If we’re talking about precise location then the only two places on earth where Anonymizer VPN has servers are Amsterdam and San Diego. This list of servers is basically useless. Useless, if you want to stream content from Britain-based online services like BBC iPlayer. Even more useless if you want to stream something from HBO Nordic. What about sports stream then? In short, if you want to sign up for a VPN service because you want to stream blocked content, then Anonymizer VPN is not for you. We’ve already told you the good news. Anonymizer VPN has a built-in DNS leak protection function in its Windows client. The same holds true for its Android clients as well. You can go to websites such as ipleak.net and check out the DNS leak protection feature for yourself. You’ll find that it works without giving any problems. With that said, know that WebRTC can detect your IP address even when you have turned on Anonymizer VPN. But that should not be a problem. Because even if Anonymizer VPN doesn’t protect against WebRTC leak, your identity is safe. Your geo-location is also hidden. It doesn’t matter if your external IP address gets exposed. This is one feature which truly pushes Anonymizer VPN as a contender in the VPN market. Anonymizer VPN Windows client comes pre-built with a Kill Switch. As mentioned earlier as well, sometimes the Kill Switch feature is known as LeakBlock. This feature basically disconnects the user from the internet if the VPN connection is unstable or interrupted. So if you somehow drop the VPN connection, you don’t have to worry since the Kill Switch will jump right into the thick of the action and disconnect you from the internet. And hence you’ll be protected against revealing your online traffic to organizations such as the government and your internet service provider. Have you ever asked yourself the question why is it a big deal for a VPN service to be based in the United States? Let us give you a definitive answer. The US is the home of the world’s most advanced spying agency. And because of that, VPN services operating out of the US cannot be trusted with your privacy. It’s not that they aren’t professional enough or are scammers. It’s just that if the government asks them to reveal data about their users, they don’t have any other choice than to comply. This situation is different for different countries. With that said, credit should be given where it is due. To protect its users against the likes of the NSA, Anonymizer has a no log policy. In other words, it does not keep any logs on its users. Users can do whatever they want and wherever they want without having to worry about getting monitored. Their actions cannot be scrutinized in the future because there is no record of them. If we’re talking about details then we should be honest with ourselves. The truth is, there is no single “log” file on any given user. VPN services all over the world keep different types of logs on their users. Now, Anonymizer does not keep any “usage” logs on its users. But the same isn’t true for connection logs. Anonymizer VPN keeps that for a period of twenty-four hours. If you go to their official website you can read the statements for yourself. The official website says that they company does not maintain any logs that would allow users to match an IP-address and timestamp to a user of their service. To put it another way, they will help the police in criminal investigations if ordered by a court. On the positive side though, Anonymizer VPN can only provide law enforcement agencies with minimal of data. Anonymizer is very upfront about this fact on its official website. But you might get in trouble if you pay for the service through your credit card. Because Anonymizer VPN can confirm to the police that you purchased the service at some given time. Of course, that wouldn’t connect you to some crime or some form of traffic automatically. So no need to worry about this. As mentioned before, there are no usage logs as far as Anonymizer VPN is concerned. But there are a few number of connection logs. These are kept for a period of twenty-four hours. The official website says that the logs are maintained by Anonymizer VPN on each customer. But these logs are limited in their nature. They only contain information such as log-in time to the VPN service. And the amount of bandwidth that is consumed. Even then, the information is only kept for a day at the max. It sounds bad that a VPN company keeps logs. But you should keep in mind that these logs don’t have any important information to reveal. Plus they are deleted in less than a day. One of the other areas where Anonymizer VPN is a pretty standard VPN is VPN protocol. The company offers the most secure and most widely used VPN protocol in the form of OpenVPN. Moreover, OpenVPN protocol is available for all platforms as far as Anonymizer VPN is concerned. As indicated earlier as well, the company does not have a native client for the Android system. In order to use Anonymizer VPN with an Android device, you’ll have to download some third party software. That is the only way to make use of Anonymizer VPN servers. You can download OpenVPN client from Google Play Store though. As far as encryption methods go, Anonymizer VPN offers the following options. Let’s first talk about the OpenVPN implementation first. Anonymizer VPN uses an AES-256 cipher. No information about the handshake key encryption size is available at the moment. Which obviously cuts more points from Anonymizer VPN’s final score. Anonymizer also does not give any information on the authentication method used. You can’t know if the company makes use of advanced technologies such as Perfect Forward Secrecy. Therefore, we can’t really judge how good the level of encryption is at Anonymizer, the company. But here is the thing about VPN services. If they don’t tell you something you ought to know, there is a problem. In this case, this means that Anonymizer VPN’s encryption level isn’t as strong as it would like people to believe. The official website looks modern. You’ll have a great time navigating through all the different sections. Moreover, the flow of content is easy on the eyes too. You won’t be needing much guidance on how to find stuff on the official website. The guides available are easy to follow. Anonymizer VPN is different from other VPN services in the sense that it doesn’t boast too much about its excellence. In other words, the people behind Anonymizer don’t say “we are the best VPN service in the world”. Part of the reason is that they are not. But the official website does a great job of conveying as much information as possible to potential customers. And while doing that, the company does not overestimate it’s worth. Anonymizer VPN gets the thumbs up as far as customer support goes. That is despite the fact that it does not offer live chat support. The only way to have contact with the company is via email and a ticketing system. But reviewers have remarked before that Anonymizer VPN representatives are quick to answer user queries and are generally helpful. Whether you are on the free trial version or on the full packages has no bearing on the quality of customer support you’ll get. Take it as you want to. More money doesn’t always equal more satisfaction it seems. To use the actual VPN service all you need to do is to download the relevant version of the VPN client. For example, if you’re working on Windows then you should go ahead and download the Windows version of the client. The process of installation is relatively easy and straightforward. In other words, no fuss. When you run the setup you should select the full install option. After that, it will automatically install the related OpenVPN software. You can also choose the settings where your existing OpenVPN settings are kept and used. Anonymizer VPN has an excellent Windows VPN client. First of all, when installed, it neatly places itself in your notifications area. You can search for it in the start bar as well. Moreover, a simple icon allows you to control and modify all the features of the VPN service. Which is great as far as convenience is concerned. As far as the actual software goes, the interface is intuitive. You won’t need any help in using any feature. Everything is laid out in an easy-to-follow manner. For you settings configuration needs there is a small drop down menu. Users can access the settings tab through it and change VPN servers if they want to. The menu also gives you the option of turning the Kill Switch feature on or off. To connect to a specific VPN server of your choice you can click the big VPN button that is placed at the top. Anonymizer is reasonably well established as far as VPN client support is concerned. The only problem is with the Android version. With the Android version, you must carry out a manual install of the .ovpn file. If you don’t know how to do that then there is no reason to worry. You should be able to find complete tutorials on the official website in the knowledge base section. All of the instructions there are easy to follow and detailed. You should have no problems in setting up the Android client. If for some reason you are unable to install the Android client and can’t follow the tutorials, then you can contact the very helpful customer support for advice. If required, they can also guide you through the whole process. Just download the related .ovpn file from Anonymizer official website. You can access the download file from the downloads section of the official website. Then go to this link and download the given app on your smartphone device. Of course, we’re assuming here that you have an Android device. After you have installed the Android app, simply run it. Then connect to the VPN server of your choice. As straightforward as you like. Even if you’re a newbie at this, you should be finished inside five minutes if not less. Make use of sites like speedtest.net and testmy.net to get a hold of your VPN’s speed. From our research, Anonymizer is nowhere near being a fast VPN service. Because of the results it gave us on our tests. IN fact, the server located in the US performed the worst of the two. Expect significant download speed drops. Upload speeds will also go down. In other words, you won’t perceive the difference. The only nice part from the speed tests was that there was no IPv4 DNS leak. This held true for both the Windows client and the Android one. The situation with WebRTC was different however. Both clients exposed the internal IP address. As mentioned earlier, this doesn’t expose your identity to the world. This doesn’t even affect your physical location and hence is not a big problem. 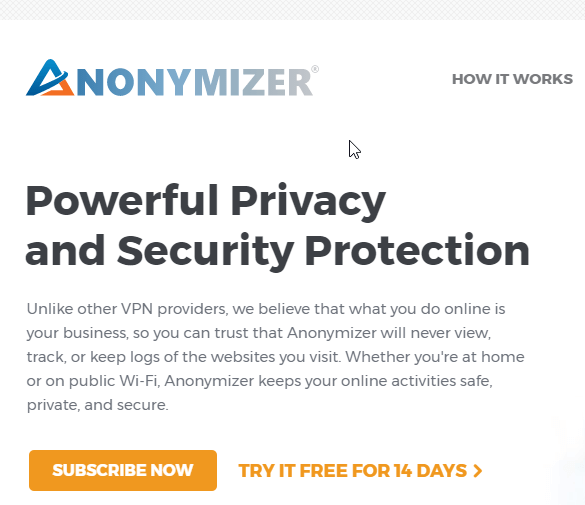 Should You Buy Anonymizer VPN? Crazily small number of servers at just two. It ss based in the US and hence prone to government subpoenas. 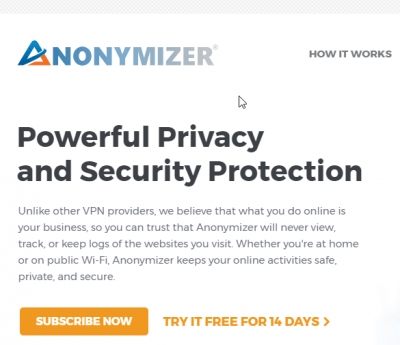 Anonymizer VPN gives you a lot of reasons to reject its VPN service. To be fair, it doesn’t have much going for it even without its glaring flaws. It’s a poor VPN service provider for the price. The biggest problems were the download and upload speed. But even if you look past that, there isn’t much to discuss here. Except for the negatives that is. Perhaps the only positive feature of Anonymizer VPN is its customer support. There too, there is no option of live chat which has become an essential feature in the VPN industry. But the fact that it keeps connection logs for a period of up to 24 hours is not acceptable. Though there are VPN services out there in the market who do significantly worse than Anonymizer VPN in this department. The fact that Anonymizer VPN scores high in this department doesn’t mean it’s a respectable VPN service. And let’s not even talk about the server problems. There is literally no choice. And one of them is extremely slow. Plus, you don’t have variety in the location of these servers. Even mediocre VPN services in the market offer more than twenty and sometimes thirty different location for their VPN servers. With that said, there is not a single reason why you would want to sign up for Anonymizer VPN. Especially when the market is overflowing with VPN services that are cheaper than Anonymizer VPN and offer much more. If you are serious about getting the best value for money VPN then you should check out IPVanish. IPvanish is the ranked number one in our list of VPN services. Read the IPVanish Review here.